This is unique in Berlin and it is exactly what we all have been waiting for: a real street-food-market! 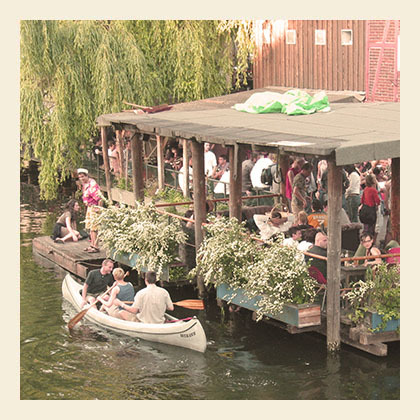 Every Thursday the Markthalle 9 in Berlin Kreuzberg is the location for the biggest Street Food Event in town. Here you can go to and try small dishes from all over the globe! The young cooks who present their specialties at the street food event mostly don´t own their own restaurant (yet). You can expect a lot of creativity in cooking-style and the different kind of flavors you can taste in one night is unique! It is always busy on Thursday evening! The crowd is bustling in front of the Markethall and waiting to get in on time to safe a seat and start tasting international specialties. Mostly young people and students come here! This is the place to be to meet up after a long day at work or at the university. Meeting up with friends, discussing life over a small dish and a cold beer. It is the perfect way to try food you have never tasted before. There is African food, Spanish tapas, Mexican Tortillas, Kimchi and a lot more for you to taste! Beside great food and fine drinks you can also expect some nice music. of course their are street musicians at the street food event, it makes the evening complete! If you go here makes sure to bring your friends and big appetite!! You won´t be disappointed! To find out what else is going on in Berlin, just read our hostel blog!